Appliances designed on models of your teeth can be used to fit on either upper or lower teeth, or on both at the same time. Whether we’re treating night-time sleep grinding, diagnosed obstructive sleep apnea, bite problems or jaw joint disorders, appliance therapy may aid our treatment. Dr. Courtney employs a variety of innovative designs depending on treatment goals and your preferences. The EMA oral appliance is a removable appliance customized by Dr. Courtney for the treatment of snoring and sleep apnea. The appliance is designed to move the lower jaw forward and open up the mouth for less restriction on airflow during sleep. The EMA appliance helps promote a deep, restful sleep by preventing snoring and relieving sleep apnea symptoms. It has nine strap lengths and four different tension options. These 36 different straps allow for careful customization for each patient case so things remain comfortable all night long. This appliance works best for patients with primarily natural teeth. Natural teeth have more uneven surfaces so that the device can grip more tightly to move the lower jaw into position. 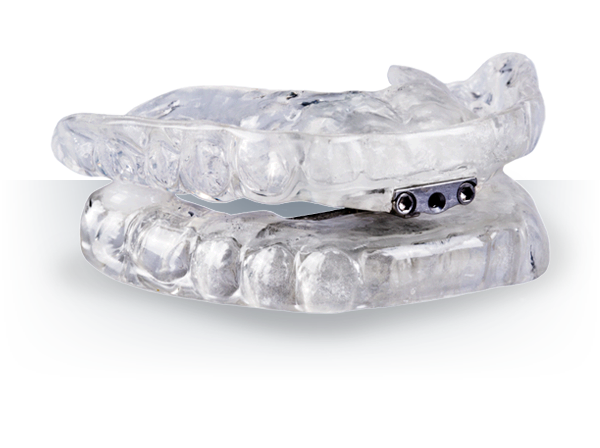 The Somnodent Flex is an sleep apnea device that is made to measure on the basis of an impression of the upper and lower jaw. The device consists of an upper and lower dental plate. The wing-coupling component allows the lower jaw to be moved gently forward into the desired therapeutic position to provide effective treatment. This forward movement tightens the soft tissues and muscles of the upper airway and prevents the tongue from dropping back: the airways remain open while you sleep. This tightening also prevents the tissues of the upper airway from vibrating as air passes over them – a common cause of loud snoring. The material inside of the Flex oral device maximizes patient comfort. The resulting high levels of patient satisfaction and acceptance contribute to the high levels of successful treatment. The two piece Tap device is fully adjustable on a horizontal plane, allowing Dr. Courtney to locate the ideal lower jaw position for the patient. This custom appliance is fabricated with separate upper and lower plates. The upper plate has a component with an adjustable screw and hook. The hook sockets into the lower plate to hold the jaw in precise position needed to maximize air flow. It also makes it incredibly comfortable and easy to adjust the device while it’s in a patients mouth. Patients can achieve optimal results on a more gradual basis for an easier transition to oral device assisted sleep.